Choosing the best overnight diaper for your baby as a parent can, indeed, be a hasstle. From the time to the patience it takes to research and goes through a plethora of brands in the market; it is no less than a very difficult and a hectic task. Definitely, a very time-consuming task too, no? To your fortune, we realize this and got your back. This article enlists the top 10 best overnight diapers that are definitely worth a purchase. Each product has been reviewed in detail to help you find the right fit for you. From the general description to the pros and cons of each; the article contains all that you need to know in one place. But before you get to that part, you might want to know if the overnight diapers really are necessary. No? And if yes, what are the things should one consider while buying an overnight diaper. Curious to know? Keep reading ahead. 1.5 5. 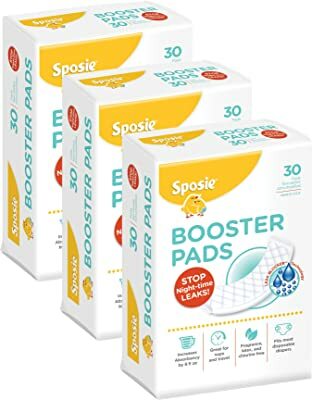 Booster Pads By Sposie. 2 How to Choose the Best Overnight Diapers? 3 What things should one look out for before buying an overnight diaper? What are the attributes that help you differentiate between different kinds of overnight diapers in order to find the best fit? Is your baby a heavy wetter during nights? 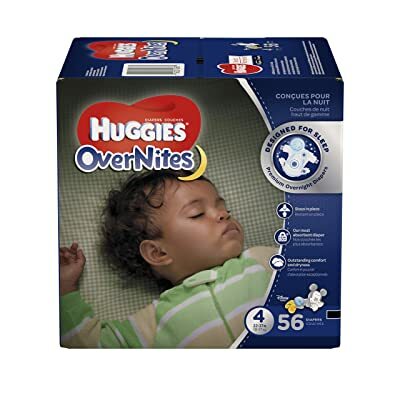 If yes, huggies overnites diapers are a very good choice for your baby. 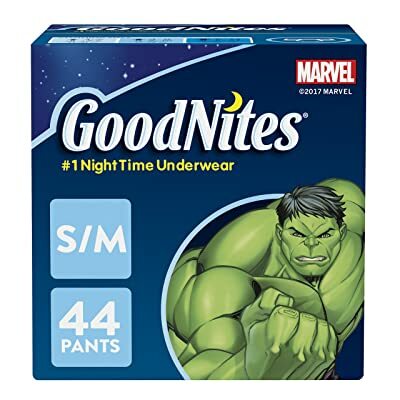 Using these diapers can surely ensure a good night sleep for your baby and you as well since you won’t have to get up at nights to change diapers. This is because it features almost everything a good overnight diaper must have. The product features a Leak Lock Design. This means that the diaper absorbs moisture very well, and keeps your baby’s skin away from the moisture. Hence, making sure that your baby is at a lesser chance of devloping rashes because of being in one diaper all night. Is not that amazing? Another feature of this product that you might like is it’s SnugFit waistband. This feature allows the diaper to fit securely, but not too tightly in order to ensure that your baby is comfortable while being safe from leaks as well. However, they might not be too good for using them over 12 hours. Additionally, these diapers also have a cute look; it has winnie the pooh all over it. The product also has some pros and cons. Curious to know? Keep resding ahead to find out more. A really good leakage protection feature. No worries about your baby getting a rash. The tabs work perfectly fine. The product has a chemical like odour which may be unpleasant. They are a bit expensive. These diapers can be used during the daytime as well as the nighttime. However, they are essentially designed as an overnight diaper. This product is a very good one. It has an indicator which changes its color on the outside to indicate that your baby’s diaper is wet. Opposed to many, this prosuct has three diaper layers and an Ultra absorbent layer. This feature allows it to provide an effective leakage protection for a span of 12 hours. But what’s the real catch? Brace yourselves, for the best part is yet to come. These diapers absorb a little more than the normal overnight diapers. Hence, they are very useful for heavy wetters. This is because it has gel layer beads that soften and swell on getting wet. Additionally, the product also features a flexible leg and waist opening. This enables you to place your baby securely in it. Sounds cool, no? The product has many pros and cons. Keep reading ahead to find out more. Offers a leakage protection for long spans of time. Fairly cheaper when compared to overnight diapers. The absorgent may break when extremely full causing a mess. You may need to size up the diapers. Worried about toxins, chemicals and other harmful ingredients in a diaper? 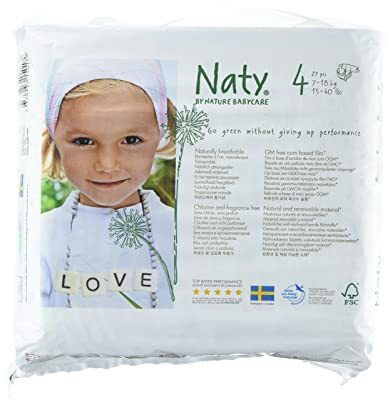 Worry not, for the Naty diapers are all natural, and do not contain any such products. They are in fact made from renewable and natural ingredients. These diapers are a really good option as well. They also hold a certification from the world renowned agencies such as EcoCert, FSC etc. These diapers are also very soft. Hence, being comfortable for use. These diapers have both pros and cons with it. Keep going ahead to find out more. This product is environment friendly. It features a very simple design. Not ideal for heavy wetters. These diapers are definitely worth a purchase if your baby is a toddler. It is for kids that are currently being potty trained, and works for them at night since they might have a problem of bedwetting. These products also have an appealing look for the toddlers. It has Marvel characters on the front fir the boys, and features Disney characters for girls on the front. Is not this amazing? It features 5 absorbent layers, and is hence effective for heavy wetters. This product has many pros and cons. Wish to know? Proceed forward to unravel. These diapers are easily stretchable. Has a good leakage protection. May give your kid a rash. 5. Booster Pads By Sposie. These booster pads are a little different than a normal overnight diaper. This is because these can not be used independently, and are to be placed inside any diaper you use. By using these you can increase the absorbency of any diaper, and it is perfect for your baby if your baby sleeps on the stomach. But is that it? Definitely, not! There is in fact much more to know about the profuct. These pads are latex free, and do not contain any toxic ingredients as well. This helps to keep the skin of your baby safe, and feel comfortable. These pads come in a universal size, and do not cause any inconvenience either. The product has some pros and cons as well. Curious to know? Keep reading to find out more. The product is extremely flexible. It is perfect for heavy wetters. Can be used for cloth resuable diapers. The pads do not stick. The crystals may leak, and cause a mess. These diapers are a very competent one here. This product features a snugly fit. 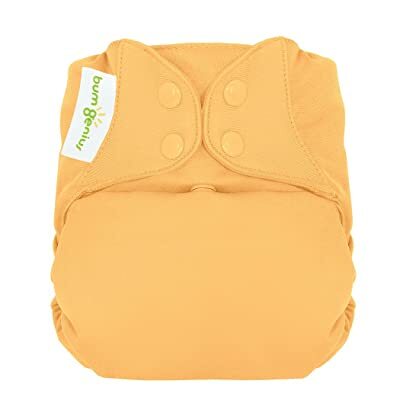 This enables a good leakage protection along with comfort of your baby at nights. Sounds amazing, no? These diapers are also very soft. Furthermore, it is has a very efficient absorbent layer that keeps your baby away from moisture all night. Hence, putting your baby at a lesser chance of developing a rash. Additionally, these diapers are not bulky either and do not disturb your baby in any way. They are also free of toxic ingredients, hence, sustainable for use. As an added plus, they are also perfect for you if you wish to buy diapers that come with cute adorable designs on it. The product has some pros and cons too. Below is everything about them. It has a plant-based outer layer. It features a securely yet gently fit waistband. They are a bit stiff. Do you use cloth diapers instead of the disposable ones? This product by BumGenius is definitely worth a purchase then! This cloth diaper is not your ordinary cloth diaper. It has a waterproof outer layer, and hence, prevents leakage. But what is the real catch? Is that all to the story? Definitely, not! Keep reading for there is a lot left to the story. It features easy-to-use snap closures, and not tabs that may open. Furthermore, these snaps can be adjusted to get the perfect size you need for your baby. These diapers are also very stretchable. They have a perfect bit. Hence, they clamp around your baby very securely but not too tightly. This feature provides your baby comfort with a very good leakage protection. It also has a good absorbency power. Additionally, they also come with cute adorable designs on them. The product has some pros and cons. Curious to know? Keep going ahead to unravel. These diapers can be reused for a longer period of time as they fit to any size. They are easy to wash. They do not require stuffing. These diapers are generally heavier. Does your baby have a sensitive skin, and you are worried about what diaper to use? 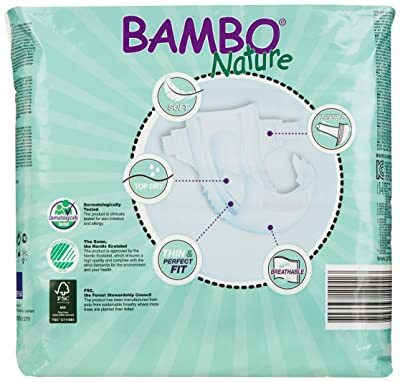 Worry not, for the Bambo Nature Eco friendly Diapers are all that you need. These diapers do not contain any such ingredient, and are made from Bamboo. The product is also dermatologically tested for use for babies that have a sensitive skin. Is not that amazing? These diapers are generally thin, and allow air echange keeping your baby’s skin fresh. The product also features a high absorbency. But is that all? Definitely, not! The product also has some pros and cons. Keep reading ahead to find out more about them. It has no harmful chemical additives. They have a soft material inner layer making your baby feel comfortable. It usually has defective tabs. 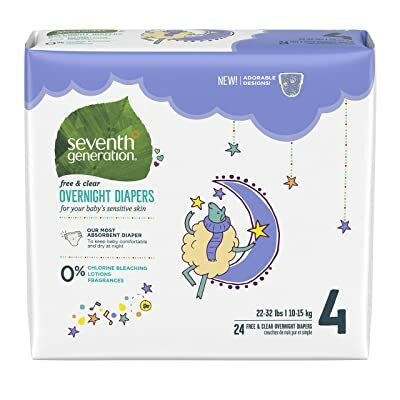 These seventh generation overnight diapers are a very good choice. They are disposable and biodegradable diapers. Furthermore, the diapers are manufactured from natural materials other than the harnful chemicals. Thus, the product is highly recommended for babies that have a very sensitive skin. But is that it? Definitely, not! There is in fact a lot more to the story. The product also features high absorbency. This means that it keeps your baby at a lower risk of developing a rash as it absorbs moisture. The product also features a high color pattern, and provides a great leakage protection. The product also has pros and cons. Want to know? Keep reading ahead to find out more about them. It is safe for babies with sensitive skins. It has no chemical additives added. The inks used for designs are free of lead and metals. Less range of sizes is available. People have reported that it may accidently leak sometimes. 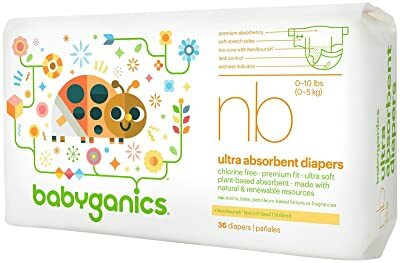 These diapers are definitely worth a purchase if you wish to buy organic products. The babyganics Ultra Absorbent Diapers are made from natural materials, and do not contain any harmful chemical additives. Thus, because of this feature the product is highly recommended to parents who have a baby with a senstive skin. It keeps their skin safe as the skin is not in contact with something toxic. It also prevents your baby from developing an allergy, if any, to these chemical materials that cause inconvenience. Additionally, these diapers also feature a good absorbency. It has a normal absorbent layer that absorbs moisture and keeps the wetness away from your baby’s skin at nights. This helps to lower the chance of your baby catching a rash. The product has many pros and cons. Eccited to unravel? Keep reading. They are friendly for babies that have a sensitive skin. They do not have any harmful chemical additives. The product also has a good absorbency power. It is not completely biodegradable. There are reports about it leaking a bit. How to Choose the Best Overnight Diapers? Being a new parent, overnight diapers may just sound a trick the brands are using to make more money from. However, that is truly not the case. In fact, the overnight diapers are pretty much different from the casual daytime diapers in terms of their functionality and features. 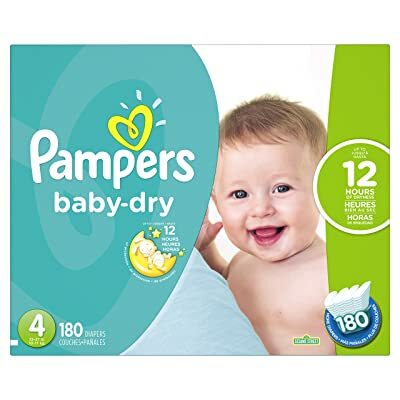 You may even hear about them from people who are not new to parenting, and all they will tell you is how important are these diapers for your baby. Now the question here is what makes them so important? Below are the major differences between the daytime and overnight diapers that explains why these diapers are so important as well! This is a key difference between the two diapers. Diapers essentially have an absorbent core to absorb the moisture and keep your baby dry and comfortable. Since, the overnight diapers have a thicker absorbent core it has a greater absorbency. And hence, is better for the night where you won’t have to disturb your baby just to change the diaper. This is another feature about the overnight diapers that make it essential to use. These diapers generally fit better, and thus, provide a better leakage protection at nights. They are also snugly which means they allow the baby to move comfortably in bed, as well as ensuring they do not leak. Is not that amazing? The overnight diapers are generally more comfortable because they are made of softer materials. It is because of this your baby gets a good sleep at night. 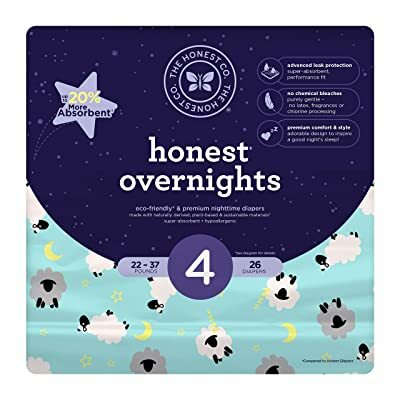 Thus, it would not be wrong to say that these diapers are very important as they are the key to ensure a good night sleep for your baby which is very vital in the early ages of growth. What things should one look out for before buying an overnight diaper? What are the attributes that help you differentiate between different kinds of overnight diapers in order to find the best fit? Now that we know that the overnight diapers are neccessary for your baby, let’s head to the next part. A lot of parents, especially, the new parents do not know what exactly makes an overnight diaper better than other overnight diapers. Well, there a number of things to consider when it comes to this. From the material used to the other ingredients that may trigger allergies, and the size and fit as well; these are one of the major things to consider before finalizing your purchase of overnight diapers. This is because it is these features that affect the Absorbency, comfort and leakage protection of the overnight diapers. To help you gain a better insight to this, below are the points that further elaborate on the features that you need to check before buying an overnight diaper. The materials used in diapers is a very important think to check since the babies generally have a very sensitive skin. Other than, in overnight diapers the material is in contact with their skin for a longer span of time as well. Thus, never compromise on this one. Generally, there are two layers in a diaper – an outer layer and an absorbent core. There are also two types of diapers i.e. disposable and cloth diapers. When using a disposable diaper or a cloth one make sure to get a diaper with more layers in the absorbent core. Especially when using the cloth diaper get a diaper with layers of bamboo and hemp instead of cotton since it retains moisture better. However, try not to get a too thick diaper as it can get a bit uncomfortable. Furthermore, when it comes to the outer layer I personally suggest that you use a plant-based plastic, and the one that allows air exchange when using a disposable diaper. As for the cloth one it is better to use waterproof coverings that are made of Polyurethane Laminate as it allows breathability. This is very important to check as the product may be incorporated with certain chemicals or ingredients that your baby may be allergic or sensitive to. For instance, some babies may not feel pleasant due to the presence of chlorine. In fact, some parents themselves are conscious about this and always try to keep their babies away from chlorinated products. To distinguish virtually, chlorinated overnight diapers are extremely whiter. Appropriate size and fit is very essential as it affects the leakage protection. Make sure that you choose a diaper that fits your baby perfectly or is a little big but never small, and fits perfectly without causing irritation or rashes. Thus, check the waistbands of the overnight diapers carefully. Never buy bulky amounts of the product you just chose and have no experience with. This is because sometimes things may not work out the way for you as they will for others. This, hence, saves you from a larger financial loss. Read out the reviews on the products. Make sure to even check the product rating. Always make sure to check the brand as well. This is because brands that are famous usually have a higher customer satisfaction rate. This rate is obviously obtained from high quality products. Make sure to buy your products from trusted websites if doing online shopping, and trusted retailers if going out for shopping. It is however recommended that you buy your products from official brand retailers and websites. However, you may get them from anywhere else too. From all the above discussion there is no doubt to the fact that overnight diapers are very useful. They are in fact indirectly involved in their healthy growth and development as well. This is because they directly affect the baby’s good night sleep. Additionally, using them will also benefit you as you would not have to get up every night just to change them. Moreover, from the top 10 product reviews we hope you are able to find the best fit for you. In the end, there is no clear winner. This is because we all have different needs, and preferences. Thus, we hope that our article helps you find the best fit that you need for use. So have you found your best overnight diaper? If yes, what is it that you are waiting for? Get your hands on the product right away!